UK/Germany, 2011, 130 minutes, Colour. Rhys Ifans, Vanessa Redgrave, Sebastian Armesto, Rafe Spall, David Thewlis, Edward Hogg, Xavier Samuel, Sam Reid, Jamie Campbell Bower, Joely Richardson, Derek Jacobi, Mark Rylance, Helen Baxendale. ‘Brush up your Shakespeare’, Cole Porter wrote for Kiss Me Kate. ‘Brush up your Earl of Oxford’ doesn’t go nearly as well (let alone ‘brush up your bacon!’). If you like that question, then try this interesting and often amusing speculation (yet again) about who wrote Shakespeare’s plays. The candidate this time is Edward, Earl of Oxford. If you don’t like the question, then check some of the bloggers on the Internet Movie Database who will prove to you, very seriously indeed, how impudent this question is. They probably didn’t enjoy Shakespeare in Love. This film owes more than a little to Shakespeare in Love but a great deal also to all those films about Elizabeth I of England with their differing focuses on the Dudleys, the Cecils and the Duke of Essex. Whom did she love – and was she in fact a virgin queen. (This speculation is definitely answering no, with some scandalous implications as well.) But, John Orloff’s complex and often ingenious screenplay links the plays to the politics, especially the writing of Richard III and a performance at the Globe Theatre to rouse the groundlings against Robert Cecil (and his hunched back). The film looks very good, re-creating London in the late Elizabethan era (plus some flashbacks to when Gloriana was younger). The dialogue is often witty, especially at poor William Shakespeare’s expense, since he was an average actor who stepped up at the cry, ‘author, author’, to take the credit (and the money) from the anonymous Earl of Oxford (who had offered the job and salary of a ‘front’ to Ben Jonson who could not take the responsibility. Rhys Iffans gives one of his best performances (very serious, so unlike his ruffian in Notting Hill) as the Earl who loved writing more than anything – the film has him writing and performing A Midsummer Night’s Dream when he was about twelve. Some scenes are re-enacted from different plays with Mark Rylance (who has been until recently the artistic director of the restored Globe Theatre in London) showing us how well a lot of the verse and performance work so well if played to the audience (his prologue to Henry V is a case in point, and there is a rousing cheer at the end of the St Crispin’s Day speech). To be or not to be also works well. 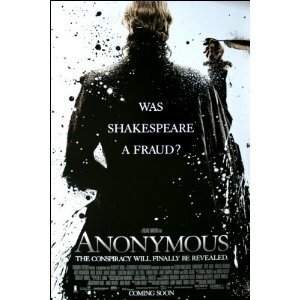 So, the mystery of the authorship is presented intriguingly (with Rafe Spall very good as the rather bumpkin Shakespeare). The building of the Globe, the murder of Christopher Marlowe (Shakespeare again! ), Hounslow and Burbage and the others associated with the Globe as well as Jonson make for provocatively entertaining sequences – with Derek Jacobi in the present providing an on stage prologue and epilogue asking us to believe this tall story. The politics is also interesting with the sinister roles of William and Robert Cecil (David Thewliss and Edward Hogg), the reasons given for the stand of the Earl of Essex in 1601, the place of the Earl of Southhampton (and an intriguing reason for Shakespeare’s very personal dedication to him). And Elizabeth. Vanessa Redgrave must be very satisfied in having the opportunity to do a portrait of Elizabeth in old age (bewigged and rather embalmed with make-up as was Bette Davis in her two films portraying the queen). She is, as might be expected, very good. Her daughter, Joely Richardson, is cast as the younger Elizabeth. Dates are skewiff if you want to review the film as history rather than as intended, a pleasing cinema hoax. Which means that it is (mostly?) nonsense – so why not enjoy it all, tongue in cheek. It does help in brushing up our Shakespeare. 1. Audiences enjoying a what if...? The memories of Shakespeare in Love, the films about Queen Elizabeth? The background of literature? Politics? 2. The film’s skill in recreating the London of the period, the scenes of the city, the landmarks, the Globe Theatre, the court, the palaces, the country estates? Costumes and decor? 3. The action sequences, the military, the rebellion, its being put down? 4. The musical score, songs from the plays, Elizabethan and Jacobean music? 5. The title, the irony, the reference to the old theories about Shakespearian authorship? 6. The prologue, Derek Jacobi arriving in the taxi, late, the audience in the theatre, the stage, his performance? His speech about Shakespeare and his authority? The return to the stage at the end? Jacobi and his conclusions, the tongue-in-cheek theory about Shakespeare? 7. The structure of the film, the prologue and epilogue, the focus on Ben Jonson, his arrest, the chases through the city, his hiding the manuscripts, the fire? The interrogations – and the return to this sequence? The threat of torture? Robert Cecil, the final confrontation, letting Jonson go? Jonson and his return to the scene of the fire, discovering the manuscripts? 9. The earl’s choice of Ben Jonson to be his front, Jonson as a writer, his rapport with actors, reputation and skills? The approach, the offer of money? Jonson’s hesitation? Shakespeare being an opportunist, going forward when the audience was crying for the author? Shakespeare and his clashes with Jonson – finally excluding him from the Globe Theatre? 10. Shakespeare himself, personality, as an actor, slow, his realisation of what was happening, his taking the bow – and his deals for cash? The scene with the prostitute? The growing acclaim, his having to keep up the front? His personal taste, the clashes with Marlowe, Marlowe’s death? His surprise at Venus and Adonis being published in a book? 11. Henslow and the other theatrical people? The building of the Globe? Richard Burbage as the actor of the day? Shakespeare using his money to build the Globe? Ousting Jonson? 12. The portrait of Queen Elizabeth, as an aged queen, the Cecils and their advice, her political decisions, whims and policy? Wigs, makeup? Seeing her without them, alone? Her expectations, her role as the queen? Her love of plays? Watching the performances of plays like Hamlet? The relationship with Oxford, the past, her pregnancy, keeping it a secret? Oxford not knowing? Oxford as a child, in the presence of the queen, as a young man, the liaison with her, the birth of the Earl of Southampton? Elizabeth not knowing? Oxford not knowing? The Cecils and their secrecy, their observations about the morals of royalty? 13. The characters of the Cecils, father and son, the influence on Elizabeth, wielding power, censorship, executions? The daughter and her marriage to Oxford? 14. The background of Shakespeare’s plays, the many quotations, Mark Rylance and his background in the Globe Theatre and his stage performances, the staging, the prologue of Henry V and bringing verve and mime to the recitation? The Romeo and Juliet scenes? The Death of Caesar? The first speech of Richard III? The showing of the groundlings, their response to the verse? Their patriotic response to Henry V? Anti-Cecil? with Richard III? 15. Oxford’s plan, writing Richard III, the one performance, a full house? The response of the people, the patriotic rousing, their marching on the palace? Ben Jonson and his betrayal? The soldiers ready, firing on Essex and Southampton? Their surrender? Essex’s execution? Southampton’s freedom? 16. The finale in Elizabethan times, the death of Elizabeth and her funeral? The accession of James I, the Scottish background, his love of plays – and insisting that Robert Cecil love the theatre? The future of England and the transition from the Tudors to the Stuarts?